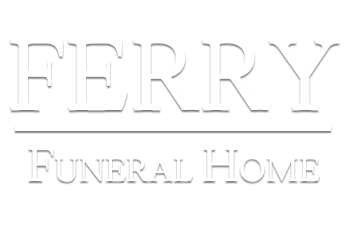 Ferry Funeral Home is one block south of Austin Blvd. on Washington Street in Nevada, MO. Enter Nevada on Highway 54 (AKA Austin Blvd. ), go to the third stop light at Austin and Washington, turn right on Washington, The funeral home is on the corner of the next block on your left. Enter Nevada on Highway 54. After you go under Highway 71 you will come to a "T" intersection at a stoplight. Turn right (west) on Highway54, (AKA Austin Blvd. ), go to the second stop light at Austin and Washington, turn left on Washington, The funeral home is on the corner of the next block on your left. Enter Nevada on US Highway 71. Get off at the Nevada, Camp Clark Exit. Turn left on Business 71 (AKA Austin Blvd.). Go approximately 2 miles to the west to the fourth stop light at Austin and Washington, turn left on Washington, The funeral home is on the corner of the next block on your left. Enter Nevada on Us Highway 71 from the North. Exit at the second Nevada exit (Bus. 71). Go approximately 1 mile to the "T" intersection at the second stop light. Turn right (west) on Highway54, (AKA Austin Blvd. ), go to the second stop light at Austin and Washington, turn left on Washington. The funeral home is on the corner of the next block on your left.